Maine, Nevada, North Dakota, South Carolina, Virginia are holding their primaries on June 12. Make sure you are registered so you can vote! Did Congress Vote to Cut CHIP? Children's Health Insurance Program (CHIP), makes up almost half of the $15 billion. The concern is it would lead to barriers to coverage if enrollment is higher than expected; i.e., think of the money as a back-up plan, if lots of new kids become eligible - due to something like a recession - there would be no funding to support them. However, the Congressional Budget Office analysis says that the rescissions would not affect any spending on children's health, and would not affect any coverage. Also, for the cuts to happen the Senate has to act, and it is still unclear if they will take up the issue at all let alone how the vote would turn out. Action items: 1) Call your Representative and share your thoughts on how they voted and your thoughts overall on the value of CHIP. 2) Call your Senators and share your thoughts on CHIP. On June 4, the Centers for Medicare & Medicaid Services (CMS) released the Medicaid and CHIP "Scorecard" that outlines quality metrics along with federally reported measures. The first version of the Scorecard includes measures voluntarily reported by states, as well as federally reported measures in three areas: state health system performance; state administrative accountability; and federal administrative accountability. The metrics included in the first Scorecard reflect important health issues such as well child visits, mental health conditions, children's preventive dental services, and other chronic health conditions. See Scorecard, summary, and factsheet here. Majority members have been discussing a provision that is effectively a tax on premiums: People with pre-existing health conditions would be charged more based on their medical history, paying above-standard rates for coverage. Even if the new plan preserved the Affordable Care Act's (ACA aka "ObamaCare") rules on guaranteed issue (meaning issuers cannot deny coverage), consumers with pre-existing conditions could still be priced out of the market. On June 7, the Department of Justice (DOJ) argued in court that key parts of ACA are now unconstitutional, siding in large part with a conservative challenge to the law. Attorney General Jeff Sessions acknowledged in a letter to Speaker Paul Ryan (R-Wis.) that the DOJ has a "longstanding tradition" of defending federal laws, but argued that this is "a rare case where the proper course is to forgo defense" of the law. The DOJ argues that ACA's protections against people with pre-existing conditions being denied coverage or charged more should be invalidated, maintaining that the individual mandate that people have insurance or face a tax penalty is now unconstitutional. Legal experts are deeply skeptical the challenge can succeed, and 17 Democratic-led states have already intervened to defend the law in the absence of DOJ action. The lawsuit in question was filed in February by Texas and 19 other GOP-led states, arguing that ACA is unconstitutional and should be overturned. The case is currently before a federal district court judge in Texas, Reed O'Connor, who was appointed by former President George W. Bush. Action Items: 1) You can share your thoughts on protection for preexisting conditions with your Governor and Attorney General, with the Justice Department, and with your congressional delegation. 2) Register now so you can vote (and encourage others to vote) in November for Governors, Senators, and Representatives who will protect access to care for people with preexisting conditions. As reported in Politico, the Trump administration is preparing to release a sweeping plan for reorganizing the federal government that includes a major consolidation of welfare programs and renaming the Department of Health and Human Services (HHS). The report, set to be released in the coming weeks by the White House Office of Management and Budget, seeks to move safety-net programs, including "food stamps", into HHS. The plan would also propose changing the name of HHS, while separately seeking cuts at the U.S. Agency for International Development and the State Department. The biggest changes outlined by the White House are unlikely to be implemented because moving multibillion-dollar programs and renaming federal departments generally requires congressional action. However, the plan, like the President's annual budget, demonstrates the administration's thinking on a range of domestic policy issues. It also offers a strong political point for the White House as it tries to create an image of an administration dedicated to conservative principles and smaller government. On June 6, Alex Azar - Secretary of HHS - provided testimony in front of the House Committee on Education & the Workforce on "Examining the Policies and Priorities of the U.S. Department of HHS". The EMPOWER Care Act (aka MFP reauthorization) continues to gain cosponsors from both democrats and republicans because of your advocacy. See HR.5306 cosponsors here and S.2227 cosponsors here. AUCD is supporting an event to celebrate the 19th anniversary of the Olmstead Supreme Court decision. On June 22, advocates can call your Senators and Representative to share with them that Olmstead recognized the right of people with disabilities to live, work, and participate in their communities rather than an institution and how MFP supports that landmark decision by helping people move out of nursing homes and institutions into their communities. Action Item: If your Member is a co-sponsor, please thank them for their support. If they are not, please continue to educate them on the importance of MFP in your state with this toolkit and pre-crated email. Please also review this two page document Your Role in Policy Advocacy as a Federally-Funded Program. On June 7, Senate voted in favor (50 - 46) of the nomination of Kenneth Marcus to serve as Assistant Secretary for Civil Rights at the Department of Education. On June 4, 12 Members of the Congressional Hispanic Caucus (CHC), led by Representatives Nydia M. Velázquez (NY-07), Tony Cárdenas (CA-29) and Adriano Espaillat (NY-13) sent a letter to U.S. Department of Housing and Urban Development (HUD) Secretary Ben Carson to highlight concerns with the department's plan to significantly increase rent and work requirements for millions of low income families who rely on federal housing assistance. The letter also outlined a series of policies and offered to work with the Secretary to help low-income Latino individuals and families afford "decent, stable housing, earn a living wage, and get ahead". Resources: Up-to-date database of vouchers targeted to people with disabilities and other special needs. An interactive tool to help you learn about the affordable housing crisis for people with disabilities in your own state and community. This week, Liz goes from being the interviewer to the interviewee. Rylin, AUCD's new policy director, stars as a guest host and interviews Liz about her time spent as a fellow on Capitol Hill for Senator Robert Casey. 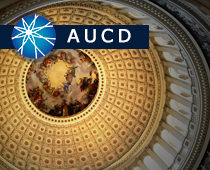 For updates from our Executive Director Andy Imparato, follow @AndyAUCD.